Coastal Brown Bear of the Alaska Peninsula are contenders for the biggest predators in the world. Regularly producing top-entry Boone & Crockett specimens, this area rivals any area in the world for record book bears. The Alaska Peninsula’s season for brown bears is in the spring of even-numbered years and in the fall of odd-numbered years. During fall hunts, we focus on finding trophy bear along salmon streams, as they eat to prepare for hibernation. This is a spot and stalk style hunt, but we often focus on select feeding locations and salmon streams. In the spring, we spend more time glassing for big boars on the move as they make their way through the mountains during the rut. Spring hunts are generally more physically demanding than fall hunts, requiring lots of hard trekking through rolling and mountainous terrain. 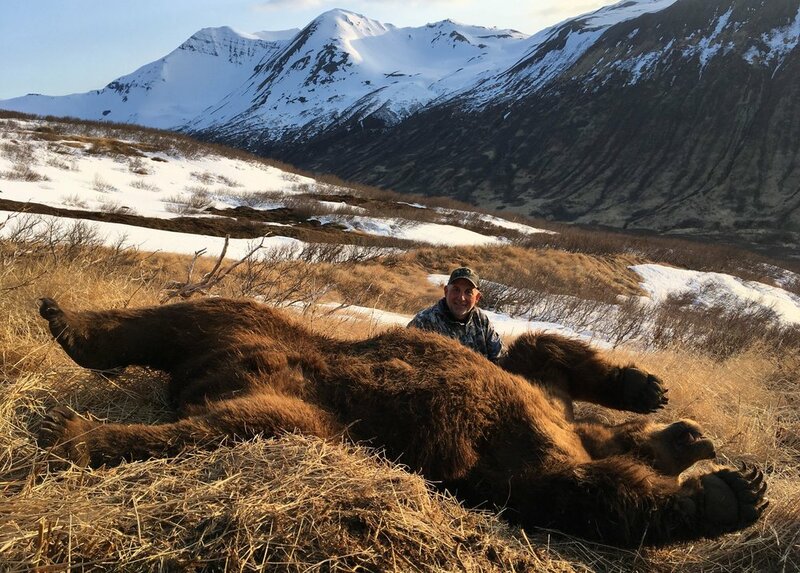 The weather on the Alaska Peninsula can be very brutal with extremely high winds and frequent rain, but the the area boasts very high population densities of trophy brown bear. Hunting on special permitted federal refuge land, we have a very high success rate in an area that was relatively untouched (and not hunted for bear) for more than 15 years prior to our acquisition in 2014. This is generally a 1 on 1 hunt with 1 hunter per guide, but does accommodate itself for a 2 on 1 hunt should you wish to bring a partner. This hunt is 15 hunting days and 17 total trip days. * This is sold as a 15 day hunt because the bear season is 15 days total. If your schedule does not accommodate such a long hunt, we can make arrangements for a shorter trip with a discounted price. See here for a full price list.